Every so often something fresh comes across the stage that revitalizes theatrical trends. Whether it be a new sound or style of voice, this new “thing” excites audiences in ways “traditional” pieces no longer do. One such piece is Summer Valley Fair written by Dylan Frederick. Blending electronic sounds, spoken word, and lyrical storytelling, Summer Valley Fair is theater ahead of its time. Summer Valley Fair follows “the girl” on her journey through first loves, finding herself, and the sad truths of growing up. While these themes are nothing new, the way it’s presented is. Summer Valley Fair is not a typical book musical. It’s closer to a concept album that is fully realized. Dylan Frederick, who stars as the girl as well as the solo scribe, breaks the mold of what musical theater can be. Frederick offers a beginning, middle, and end. He presents a struggle. He gives characters, though youthful, that have depth. But the style in which Summer Valley Fair comes to life sets it apart. Frederick is a lyrical wizard. His poetry paints a vivid story that resonates. Part song, part spoken word, Frederick drops a pop-infused beat into the words that stylistically fits. It also happens to be a three piece musical. 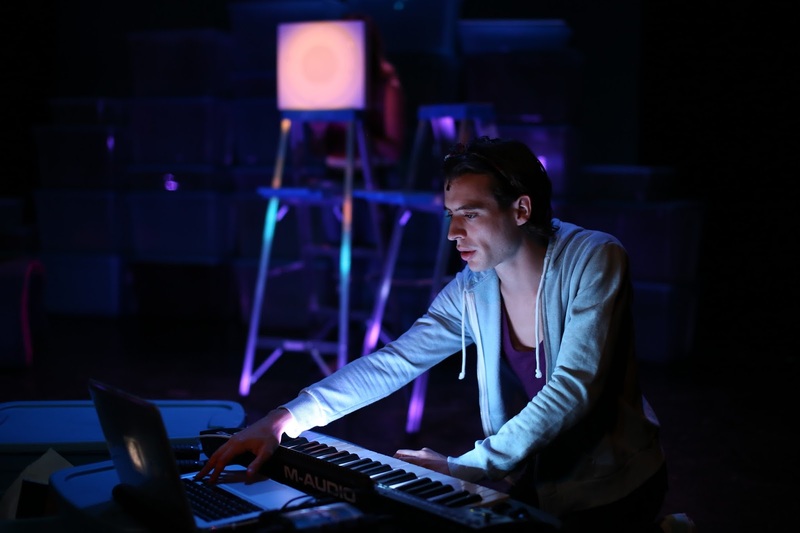 The three actors take on the role of “musician” as well, using just their voices and the items surrounding the stage to aid in the prerecorded beats. With effortless harmonies, the music is a delight to listen to. Performing in your own musical is a giant risk. Part of the danger is discovering if the work can survive without you. There are many writer-performers who have successfully done it without it feeling self-indulgent. The role of the girl is a very specific part. It requires a certain actor to capture the gender-bending qualities that make it so rich. Dylan Frederick is simply wonderful as the focal character. He is believable as a 16 year-old girl. It will be insanely difficult for Frederick to find another person who can fill his shoes. Summer Valley Fair could not strive without the brilliant support of Oriana Lada and Barrett Riggins. Lada and Riggins play the various supporting roles with ease. As polarizing first loves, Lada and Riggins bring honesty and sensational voices to the stage. They blend well with Frederick making his decent voice sound powerful. Without the power of Lada and Riggins, Summer Valley Fair may not be as strong as it is. It’s very easy for a great script to be phoned in by a director. But fortunately for Summer Valley Fair, not only did Taylor Norton have an incredible vision, she took thoughtful and intricate care of Frederick’s masterpiece. From first sight, the found object inspired set with plastic bins, ladders, and an assortment of props looks unpromising. But Norton took Ashlee Springer’s attic inspired set and transformed it into a visually stunning world. Norton took the simplest of staging and created glorious stage pictures, though she was gratefully aided by Joseph Thompson’s beautiful lighting looks. From the rollercoaster created through the bins to the glow on the girl by the keyboard, the entire design was cohesive and stunning. It’s hard to truly describe the experience of Summer Valley Fair because it is something extraordinary. It’s something I won’t forget. Dylan Frederick has created something worth remembering. Frederick and Summer Valley Fair have their pulse on the future. And if this is the sign of what’s to come, it’s exciting.